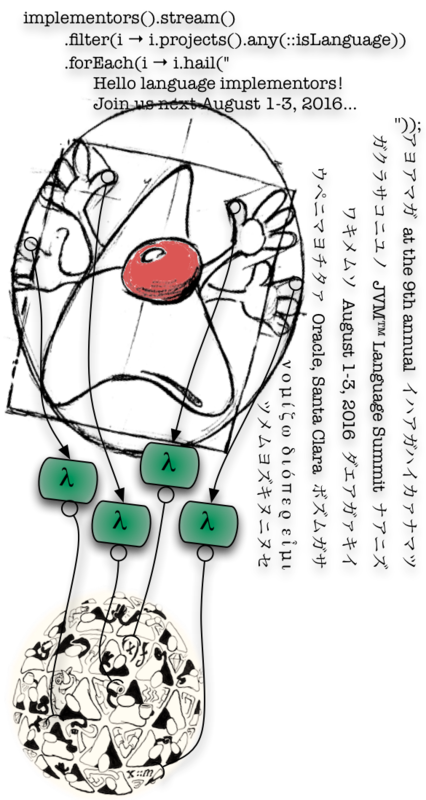 The 2013 JVM Language Summit is an open technical collaboration among language designers, compiler writers, tool builders, runtime engineers, and VM architects. The format this year will be similar to last year. We are dividing the schedule equally between traditional presentations (limiting most presentations to 40 minutes) and “workshops”. Workshops are informal, facilitated discussion groups among smaller, self-selected participants. They enable “deeper dives” into the subject matter. There will also be impromptu “lightning talks”. As was the case last year, we expect the presentations will be recorded. Space is limited: This summit is organized around a single classroom-style room, to support direct communication between participants. We have reserved a large conference room, but if the available space fills up, presenters and implementors will be given priority. Videos and slides from previous years: 2008 and 2009, 2010, 2011, 2012. The JVM Language Summit Web page, including abstracts and slides on the wiki: 2008 (wiki), 2009 (wiki), 2010 (wiki), 2011 (wiki), and 2012 (wiki).